The opposition to the T-Mobile-Sprint merger grew today as several U.S. Senators sent letters to the FCC and Department of Justice to oppose the deal. A group of U.S. Senators led by Richard Blumenthal (D-CT) today announced that they’ve signed letters to both the FCC and DoJ to explain their opposition to the proposed merger of T-Mobile and Sprint. The group includes Amy Klobuchar (D-MN), Tom Udall (D-NM), Sherrod Brown (D-OH), Kirsten Gillibrand (D-NY), Elizabeth Warren (D-MA), Bernie Sanders (I-VT), Cory Booker (D-NJ), and Edward J. Markey (D-MA). In the letters, the senators lay out their arguments against the merger, including claims that the merger will lead to “dangerously high levels of market concentration” and that it will “likely cause Americans’ monthly bills to jump dramatically.” The senators argue that while T-Mobile and Sprint say that the combined carrier will continue to act as an Un-carrier and be incentivized to fill up its capacity by keeping prices low, T-Mo is more likely to be disruptive if the merger is blocked and today’s competitive market pressures continue. The senators also argue that the merger is “bad for workers”, citing a Communications Workers of America estimate that the deal will result in up to 30,000 lost jobs. They’re also concerned that low-income consumers will be hurt by the deal, as the new T-Mobile would control approximately 43 percent of the prepaid market, which could lead to prices increasing by at least 10 percent. “Because low-income consumers disproportionately rely on the prepaid wireless market, these communities will suffer the most, despite being the very communities that our antitrust laws should most vigorously protect,” the Senators say. The letter goes on to say that both T-Mobile and Sprint maintain standalone paths to nationwide 5G, despite the carriers saying that the new T-Mobile is “the ONLY company with the capacity to quickly create a broad and deep nationwide 5G network”. The senators say that T-Mo and Sprint are disparaging their own standalone network features and that this is a “common tactic.” “When AT&T attempted to acquire T-Mobile in 2011, the latter was portrayed as a failing firm with “no clear path” to LTE. Today, by some accounts, T-Mobile boasts better LTE coverage than AT&T – a testament to the decision to reject that acquisition,” they say. Finally, the senators say that the merger offers little for rural consumers and that it could have a negative impact on rural access. “Neither Sprint nor T-Mobile as standalone companies have demonstrated a strong track record of catering to rural America,” the letter reads, with the Rural Broadband Association claiming that T-Mobile has neglected to use the spectrum it has in rural areas and that its statements offer few new commitments that that would change if the merger is approved. Meanwhile, the Rural Wireless Association says that Sprint is the only U.S. carrier to offer “anything approximating commerically reasonable roaming rates, terms, and conditions to rural carriers” and that the new T-Mobile is unlikely to provide mutually-beneficial roaming agreements with regional carriers because it has little incentive to do so. 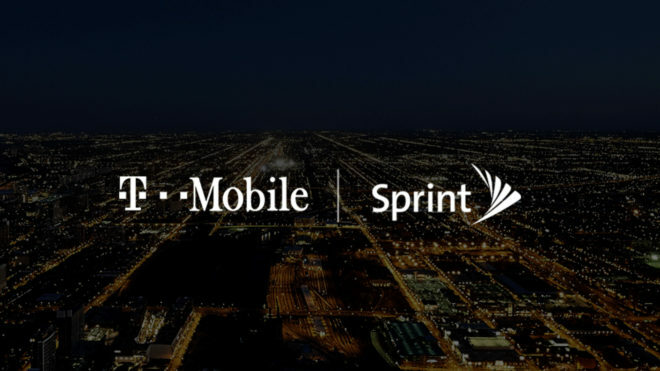 Just last week, the T-Mobile-Sprint merger gained approval from the New York Public Service Commission. Now the deal is getting some new opposition in the form of a group of top senators, including some who have announced plans to run for president in 2020. And this isn’t the end of the high-profile T-Mobile-Sprint merger news for the week, as T-Mobile CEO John Legere and Sprint chairman Marcelo Claure are set to testify in front of the House Commucations & Technology Subcommittee on February 13 and the House Judiciary Committee on Antitrust on February 14. So what does that make President Trump and his Department of Justice when they sued to block the [vertical] merger between AT&T and Time Warner? I see your point, but the AT&T/Time Warner merger is much bigger–these 2 have much longer tentacles and control (own) may more things, such as content production, cable channels, cable/broadband systems, wireless networks, fiber backbones, transatlantic fiber, etc. Sprint & T-Mobile only own wireless networks, some fiber backbone (Sprint), and Level3 isn’t big enough to be considered a factor in the cable tv business. Also, AT&T/Time Warner would create more quasi-monopolies in the home broadband world while options would continue to exist in the Sprint/T-Mobile merger. Bigger or not, the point was there was nothing “America-hating” with this request. In fact, it is very pro-American to block these types of megamergers before these companies turn into the AT&T of old. Especially when they tout blatant falsehoods of creating new jobs, increasing competition, and lowering prices. All things that are not true when horizontal mergers occur. att is already too big and needs to be broken up into 10 billion pieces. sprint is going to go bankrupt. if they do, att and verizon will gobble up most of the pieces. that would be VERY VERY bad for the consumer. in fact, att and verizon should not be allowed to buy any spectrum or companies for the next 1,000 years. With all due respect, please read up on the difference between a horizontal and a vertical merger. My point to the OP was to highlight the hypocrisy in his or her post. Not to say I really agree with this, but have they done the same thing for at&t, Verizon, Disney mergers etc? they probably want the government to run wireless.. the new anti capitalism radical socialist democrats..
Are you aware of how wireless works in Europe? Well they were down on the path of government running cable even more than they do now – with the bogus Orwellian named net neutrality which was anything but. Fortunately that was axed, and miraculously within a year, the US went from 12 to 7th in worldwide average data speed. Yeah, many millenials think the government should take over all Internet. The same anti-free speech communist kooks who are proposing to raise income taxes to as high as 70%, that it is immoral and should be illegal to be a billionaire, etc., etc., ad nauseam. Please. That proposal which only refers to people who make over $10 million/yr and only applies to the money they make over the $10 million will probably never pass anyway. And here you are getting all upset about an amount of money you’ll probably never make over your entire lifetime. Relax. The truth hurts as evidenced by your ad hominem attack. You’re having a go at them for their supposed income, so probably that’s where the ad hominems started. Not at all. I made an assumption. 99.9%+ of the world makes less than $10 million over their entire lifetime. I think it was a safe bet. Not at all an attack. You reply rudely, then label getting called out on it an attack. Keep it up keyboard warrior. Keyboard warrior. Ha. That’s cute. I didn’t consider it replying rudely, but if you took it that way, my apologies. Either way, it’s not like I was wrong. You’re literally upset about something that will likely never affect you. I make six figures a year and will likely never clear $10 million in my lifetime, let alone in one year. That being the case, I don’t really care all that much. I’m sincerely happy you make six figures, for real. I was not upset, the original point was not about me, i don’t begrudge anyone their exploits- directly or by trickle down the rest benefit. One more or less kaziillionaire or homeless makes zero difference. But at zero billionaires we’ll be the next Venezuela. Prior to around the year 1980, the “rich” were marginally taxed up to 90% of their income. Guess what? The “rich” were still rich and the middle class did better than they do today. In other words: The middle class wasn’t on the verge of disappearing like it has for the past couple of decades. Yeah there was a high tax rate. Yet there are tons of loopholes. So from my research the real tax rate was about 40%. Tax the rich 70% watch them go to other countries. Leaving the lower income to pick up the taxes they aren’t paying. Plus all their businesses! NY tried taxing those earning over $200k and their tax revenue went DOWN. According to the IRS the top 1% tax payers pay 37% of the taxes. You lose even a few of those and middle income taxes go through the roof…. Spot on. And the figs when looked at FROM THE BOTTOM end of the scale are really worrying: bottom 48% pay 2% of taxes, bottom 2/3 take in more in benefits and subsidies than they pay out in taxes. Even more ominous, the numbers will only worsen, as the reproductive rates for the bottom dwellers are way higher. The numbers explain everything that’s going on today in America with showbiz, sports, economy, law, social mores…a race to the bottom. Short term we’re still hanging by a thread only because we discovered fracking and medical advances are keeping people living longer–the older the wiser. But long term we’re slipping towards banana republic status– and we can’t even grow bananas! That in the day when everyone had company cars, various passes, free services from the company etc, because as long as the company paid and it wasn’t on your paycheck it wasn’t taxed. Now we have lower taxes, but there is no incentive for the company to give you a car any longer – or home stipend, etc. CEO’s are now even taxed for taking the corporate jet places. How did you get a free market comment deleted? Is this like twitter or something, anything to the right of socialism gets whacked? Are you having a stroke? Prices went down for Metro customers and they got access to a nationwide LTE network. That Metro spectrum was used to bolster the T-Mobile network. Look at the Detroit market as a prime example. T-Mobile had the legacy Voicestream network and ended up with the old AT&T Wireless spectrum via the Metro merger. That still wasn’t enough, they supplemented it with band 12. Band 12 is not for back hall at all idk why you guys think that. Its strictly for stronger singal inside building and longer distance. If you have a newer phone then 4×4 mimo and LTE-A will help with speed. If you have a older phone forget it. Can Sprint even self-sustain and grow out their own network at this point? What is keeping Sprint from performing a T-mobile and turning itself around? Edit: I do remember T-mo got that big payout when the AT&T+Tmo merger failed… so that probably helped substantially. Most areas have 3 or more carriers, even in rural? So not sure I’m so concerned about them merging. It’s not like cable. Cable does not matter in many rural areas because there is none. Areas like mine rely on wireless for our home internet. Consequently, we prefer to keep all four. We’re not even at the point that every patch of the US has cell coverage, much less a reliable data connection, so not sure that’s even a reality. Wireless probably moved in because you were under-served and it’s providing you access, which is great. Company #3 and/or #4 though have to see some reasonable ROI before they will move into an area. Eventually most areas will have some sort of coverage, then I think those companies will continue to grow out and fill out in those areas. Provided there is no other barrier like over-regulation. The issue I think is that two of those companies have a boat load of funds to grow out at a very fast rate, while company #3/#4 are more limited in what they can afford. So for the smallest, it’s like playing catch-up. That’s costly if it’s just for appearances. So T-mobile focused on metros for years, but in TX they competed really well early on. Even in rural they had “decent” coverage for the time. If all had alternative sources of income, it would probably be simpler to keep all four. It’s different for cable. Municipalities and so much red-tape to just get a franchise/agreement. Locales signing exclusivity agreements with those companies anyway in the beginning making them defacto the provider and so that industry was was never build up to be competition friendly. So bigger fish bought smaller fish for those luscious contracts. Not every company can afford to get in obviously. It’s even more rarer than one provider to go into an area at the same time. In Houston, this is no longer true, we used to only have Time Warner & SBC(?). Now multiple sections have multiple. In the NW section, we have AT&T fiber/U-verse and as a result, I’m able to pay a lower price to get access to TV/internet. Except this year they raised prices a bit to counter cord-cutting. It’s precisely because of deregulation U-verse was able to even get in. They just put fiber in our area, so I’m able to connect to 100Mbps for $50/mo+tax… Comcrap is competing for $70 for around 150Mbps. No matter what, sprint is done. Would you rather they merge with tmobile? Or would you rather their carcass be bought up by Verizon and att? Which is better for the consumer, which is worse? I would prefer Sprint merge with Comcast. Sprint should merge with a different company who is not a player in wireless, don’t merge with T-Mobile. We need the market to be competitive. Edit: I do remember T-mo got that big payout when the AT&T+Tmo merger failed… so that probably helped substantially. T-Mobile did not get a big payout after the failed AT&T merger. Deutsche Telekom did. And the fee was about $3 billion. It honestly has nothing to do with money. Yes, but DT wanted to cut Tmo US entirely iirc, so it may have helped chill them out for when the new CEO came in and he took a different approach. I never said it anything had anything to do with money because I literally have not read up on anything Sprint in a very long time. The last time I heard, SoftBank bought them and then they wanted to offload. So I guess that would still be the reasoning. Yeah when Sprint goes bankrupt, its property goes up for auction and there is no guarantee that Tmobile would get the goods. Talk about timing. There’s been so many other mergers they could have done this for and they didn’t. So now the most open company tries to merge, and it’s an issue.